Coalition Technologies is on the forefront of web design and constantly rises above expectations. We’ve applied this experience and knowledge to our Bigcommerce client sites. We’ve been working with the Bigcommerce platform for years, and we have seen it grow from a young start-up to one of the world’s leading CMS platforms. Throughout our time working with clients on this platform, we have developed a respect for its functionality and the level of customization it allows its users. These are the key reasons why we create our clients’ e-commerce websites on this platform among a few others. Our designers especially love Bigcommerce, because it gives them direct access to a store’s code, so we can configure it to our client’s preference, as well as in the way that will bring the best results. Bigcommerce loves us too! So much that they’ve listed us as one of their certified partners, because of the work we’ve delivered to our clients on this platform. The web design team at Coalition Technologies is the best at what it does. Our web designers are constantly looking for ways to improve upon traditional design methods, and our clients experience strong results because of it. By having the freedom to create attractive and distinctive websites for our clients on the Bigcommerce platform, we’re better able to attract the revenue sources that make a difference on their bottom line. Bigcommerce uses HTML/CSS, the languages that currently drive most web designs. Our team of professional web design experts is well-versed in these languages and knows how to create a product that our clients are proud of. Being able to access and edit the store’s HTML/CSS files is a reason why Bigcommerce is one of our preferred CMS platforms. Our Big Commerce Portfolio. Click thumbnail to visit site. Additionally, the ability to create and upload unique content to clients’ Bigcommerce sites empowers us to build something that attracts consumers and makes them loyalists to our clients’ businesses. Coalition Technologies has always prided itself on being one of the best search engine optimization providers around. As such, it is no surprise that we keep an eye on SEO when designing our client’s websites. 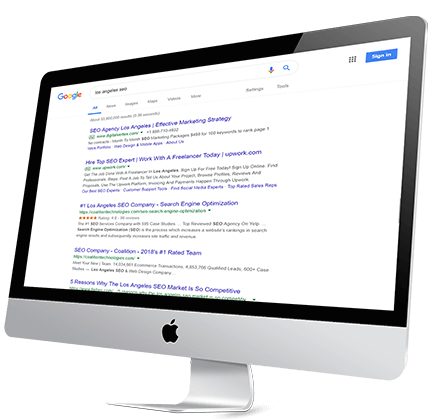 We want to build sites that earn high rankings from those pesky search engine algorithms. Bigcommerce helps us in this endeavor, because their basic store package already follows some of the SEO industry’s best practices and enables us to easily make changes with search engine marketing in mind. The result is a beautifully designed and persuasive site that experiences high traffic volumes from search engines. The design of your website has both aesthetic and technical ramifications, and these are the reasons why you should take your Bigcommerce design seriously. Coalition Technologies is ready to support and lead your next Bigcommerce campaign, and we will demonstrate why we are one of few providers selected to be a listed certified partner. Contact us today and start the conversation about how we can deliver the results you want. Call to learn more about the Coalition Difference.